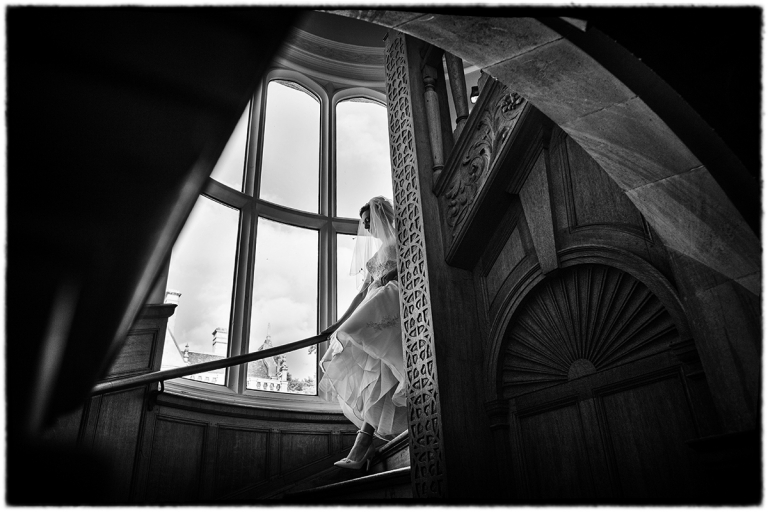 Joanna didn’t have too far to walk to her ceremony as she got ready in the room directly above at Rushton Hall in Northamptonshire. I like to use architectural elements in my photography and the staircase here lends itself well to this with the spiral shape and surrounding arches. A 24mm wide angle lens allowed me to compose the image to make the most of the architecture. Black and white removes all the distracting colour from the image leaving just the shapes and the moment. My aim with these sort of images is to allow the bride to feel the emotion of the moment when she looks back on this photograph in years to come.